I'm picking up this French-inspired book at the library tomorrow. I'm also re-reading To Kill A Mockingbird for the first time since high school. (A book club I'm in selected it to read this month.) What are you currently reading? Balance bike races are catching on for toddlers and preschoolers. I firmly believe that training wheels will become obsolete within a generation or two, thanks to pedal-free balance bikes. I literally have to sprint to catch up with my one-year-old on his Strider (purchased on Craigslist), but I have no desire to enter him in a race! Rethinking Common Core for Schools. This is the first year Oregon is implementing common core curriculum standards, and parents here and across America are realizing how drastically it's changing their child's school experience. Here's one mama's take on how common core is slowly changing her child. I'm really impressed by the concerned parents who are starting important conversations about education. These parents the ones Margaret Mead was talking about. 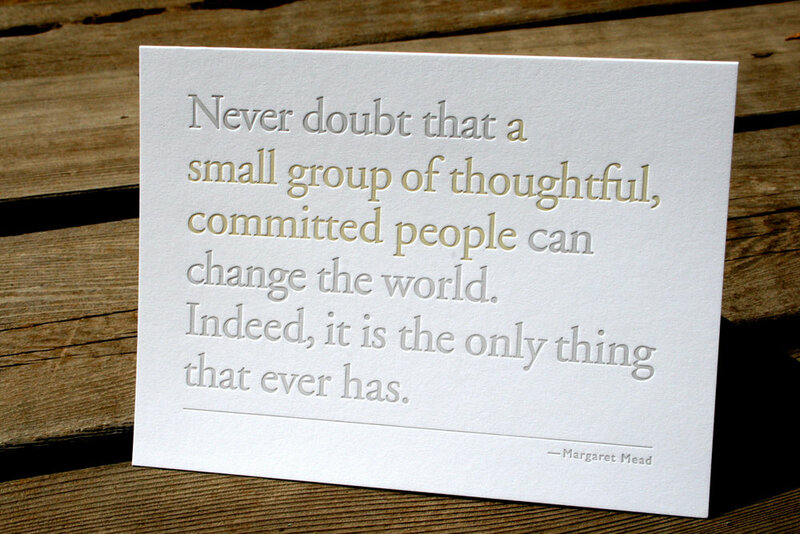 Margaret Mead quote in letterpress from FullCircle Press on Etsy. Should cursive still be taught in schools? (It's not part of the Common Core!) The Case for Cursive from Montessorium was getting a lot of attention last week. I think there are some fantastic arguments for continuing to teach it. Here are a few reasons Why the Death of Cursive Writing Will Haunt Visual Designers.